Discussion in 'Tesla, Inc.' started by doug, Mar 2, 2009. Tesla Motors Inc. is opening a Midwest regional sales and service center in Chicago, the first of seven retail facilities the electric vehicle manufacturer plans to launch this year. The Chicago store -- which will open this spring -- is at 1053 W. Grand Ave., near the Kennedy Expressway in the River West neighborhood. The site is visible from the Ohio Street off-ramp and offers convenient access from the suburbs and further afield. The location gives prospective customers the opportunity to experience Tesla’s best-in-class performance under a range of driving conditions, including highways and urban streets. Looks like it used to be a GE building. I think that the place looks a little dumpy to me... but I'll bet they will clean it up well. Yeah, we went through that with the LA store. It's a good location for accessibility and to get a decent amount of space for a reasonable price. No foot traffic or "high profile". It does happen to be about 3/4 of a mile from my office. I'll be sure to post some pics once they really get to work on the space, as I drive by it every day. * Space is wide open with 15-16' ceilings & building is rectangle shape and easy to subdivde. Looks like a building with potential that could be nicely converted. I wonder what the budget is. That four story structure it's connected to appears to be primarily an apartment building, with a first story storefront occupied by Mark's Pest Control. Is that huge billboard still going to be there when Tesla moves in? Not quite as nice of a vibe as being next to a Starbucks under a big iPod ad. As an aside, it's interesting how the person who did this listing consistently misspells the words frontage, visible, and available. "Traffic count visiable to this location is over $250,000 cars per day"
Is that a typo, or do you really measure traffic count in dollar cars per day? That reminds of the time I saw a man selling orchids out of his car. He wrote, in massive letters, "orkhyds" all over the windows. Also, it seems like once again the Tesla Store is going to be just across from a gas station. Looks to me like it should be visible from the interstate. They busy, busy interstate. I've driven I-94 during rush; now I take the train whenever I go downtown on weekdays. Tesla would be wise to put up a big (tasteful) billboard because there's a lot of money on that road refusing to take public transportation. It looks like a brisk walk up Clinton, Kinzie, Milwaukee, and Grand from the train station. But I'm not too sure of the neighborhoods. Maybe after they get established and my wife and I are downtown for a show or festival, we'll buzz over there. Is that only cars that are over $250k can see the sign or does the sign shut down after $250K worth of cars drive by? I was told by the way that the LA store was offered the 'Apple" billboard. Well based on what mt2 had to say, visible to 250 thousand cars a day sounds reasonable. It will be interesting to see if/how they maintain the same design themes. Chicago seems like an ideal place for the sedan to take off, as we see countless high-end sedans commuting into the city, where Cars.com is based. However, speaking as locals, we’re curious as to why Tesla chose the River West neighborhood to open its shop. While the location at 1053 W. Grand is large enough for the company’s needs, it’s not a part of the street that gets walk-by traffic, nor is there plentiful parking anywhere nearby. In fact, driving that stretch of Grand heading toward downtown you wouldn’t even notice this building. The only benefit would be that perhaps people passing by on the Kennedy Expressway — especially the Ohio offramp which heads straight downtown — would see a billboard or signage and have their interest piqued. A location in the trendier West Loop, with its many restaurants and shops, would have seemed like a more natural fit to us. While Cars.com's Kicking Tires blog questions the locale, we think it makes sense. We're going to assume that Tesla's not going to have the dealer network of Honda or even BMW anytime soon. With one location for all of Chicago (and the Midwest), the Grand Ave. location does offer "convenient access from the suburbs and further afield" while at the same time remaining close to the toniest parts of downtown. Even after Tesla introduces their lower priced sedan next year (MSRP around $60k) these are not exactly impulse purchases that require high levels of showroom foot traffic. And given that these cars aren't the type of thing you want the neighborhood mechanic fixing, the address should minimize time spent traveling to the dealer for service, whether coming from from Oak Park, Highland Park or Lincoln Park. The parking at the LA store is non existent, they really don't need it except for themselves. The term MSRP no longer applies with this model. The store will be located in the chichi River West neighborhood in an attempt to reach wealthy cattlemen (yeah, I've only been to Chicago once) commuting in from the even fancier suburbs. No word on the size of the bribe Tesla had to pay the local government to get a building permit. 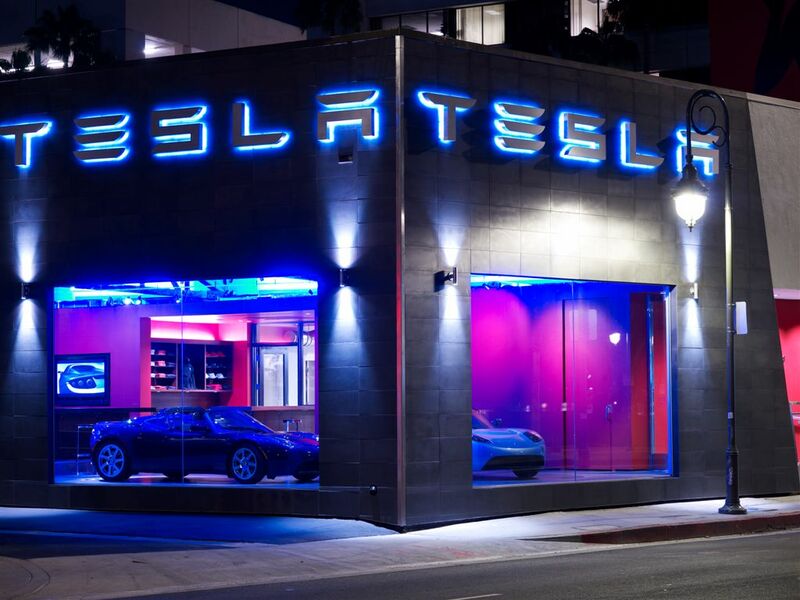 Can anyone comment as to whether Tesla sent specific invites to a grand opening event for the LA and other store(s) to those who had made deposits for the Roadster? Just wondering if you think they'll have a premier type event at the Chicago store for those of us from the midwest who've made a deposit. Thoughts? In the past, Telsa has invited everyone that had a Roadster on order to both store openings. I skipped the LA opening, but attended the Menlo Park one. I expect that they'll continue that tradition, including also people that ordered the Model S. They will request a RSVP, to know how many attendees to plan for. Since my hometown is Champaign, I may just use this event as an excuse to come back and visit the relatives. It's a little bit of a trip for me, but an excuse to go to Chicago is a good thing, and I have family in the burbs so I'd have free lodging. Hopefully they do have a nice big opening.